The Ford Sierra RS Cosworth turbocharged 2-litre engine develops 204 PS at 6000 rpm and a beefy 276 Nm of torque at 4500 revs. Significantly, the engine produces 80% of its maximum torque at only 2300 rpm right through to a spirited 6500 revs. The power unit was based on a production 2-lite cylinder block fitted with an exceptionally efficient light alloy head. Twin overhead camshafts, driven by a toothed rubber belt reinforced with glassfibre, operate four valves per cylinder. In essence, that layout had been proving its worth ever since the Formula 2 Ford-Cosworth FVA engine was announced back in 1966. To achieve the high degree of carefully controlled “squish” needed for low exhaust emissions and good economy, the Sierra RS Cosworth’s forged aluminium pistons have a shallow bowl receded in their crowns. Piston temperatures at high boost pressures were controlled by oil jets directed at the underside of each piston at the bottom of its stroke. In the same spirit, the engine had sodium-filled exhaust valves designed to withstand high temperatures. Forged and heat-treated connecting rods join the pistons to a forged-steel crankshaft with five main bearings. There were nine flywheel attachment bolts, instead of the usual six and a special heavy-duty clutch assembly. The gravity die-cast alloy sump saves weight and improves oil cooling. 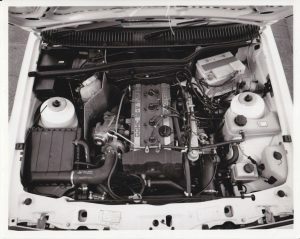 The engine’s inherent efficiency was boosted by a Garrett T3 turbocharger set to generate as much low-speed torque and had a 0.55 bar maximum boost. It is compatible with power outputs in excess of 300 PS when the Sierra RS was used for Group A competition work. Multi-point fuel injection, fully-programmed electronic ignition and control of the air-to-air intercooled turbo’s wastegate characteristics are handled by a very advanced “black box” developed in association with Weber and Marelli. Information fed by sensors to a “map” in the engine’s computer triggers delivery of exactly the right amount of fuel needed for maximum combustion efficiency. The engine’s design is optimised by equally advanced manufacturing technology. The aluminium cylinder heads, for instance, came from the most modern casting facility in Europe, where state-of-the-art processes had been perfected by Cosworth avoiding contamination by pumping molten alloy straight from furnace to mould. There was no contact with the air until the metal has solidified. Components are machined with the help of computers and lasers, and then assembled with micron-perfect precision in a high-tech facility built specially to handle the Sierra RS Cosworth’s engine. One of the tests carried out during its long, detailed development programme involved running an engine virtually non-stop for the equivalent of 27,000 miles at 150 mph. 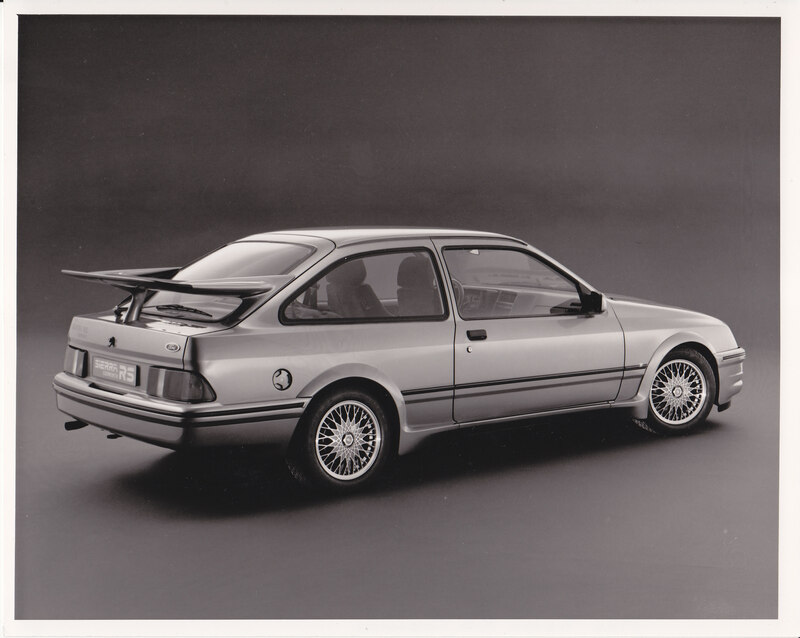 Far from being a design gimmick, the eye-catching rear wing was one of several features developed to enhance the Sierra RS Cosworth’s overall aerodynamic efficiency. Tested in Ford’s wind tunnel, where speeds exceeding 180 mph had been simulated, the ‘wing’ generated a maximum 20 kg of down force at 150 mph. The gear change was the best five-speed action Ford had ever offered, along with a high-tech limited-slip differential. The close-ratio transmission was geared to maintain vivid but smooth acceleration right across the performance range. Ford’s computed figures include 0-60 mph in 6.5 seconds. Fifth gives 22.8mph per 1000 rpm to combine strong flexibility with relaxed cruising. The aluminium gearbox housing combines high strength with low weight. 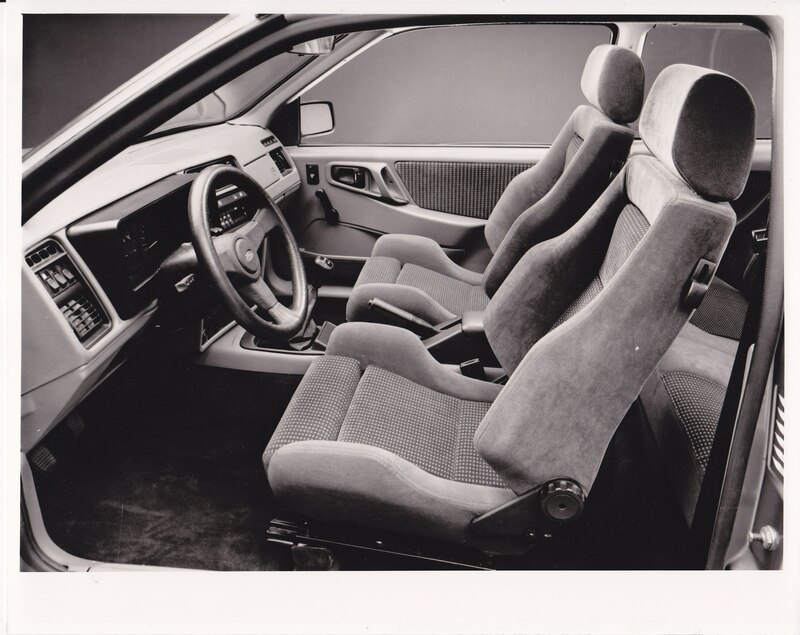 The Sierra RS Cosworth had superb Recaro seats. Fully adjustable and trimmed with attractive cloth, they are typical of a comfortable, convenient car whose other standard features include front and rear seatbelts. 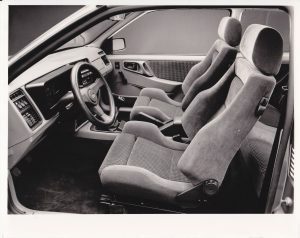 The Sierra RS Cosworth also had a 170 mph speedometer, a turbo boost gauge and a neat, leather-trimmed knob for the gear lever. 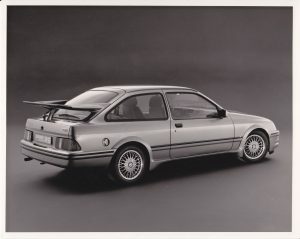 The Sierra RS Cosworth had ventilated discs at the front, plus all the high-tech advantages of Ford’s electronic anti-lock system. Riding on fully-independent suspension uprated By Ford’s Special Vehicle Engineering team – and complemented by 7” aluminium alloy wheels with ultra-low profile Dunlop D40 205/50VR15 tyres. 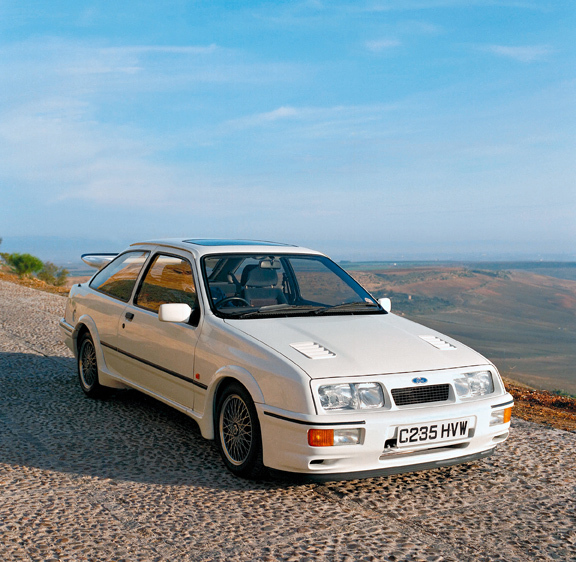 The Sierra RS Cosworth hatch had numerous successes on the rally scene and of course on the race track before the Sierra RS500 Cosworth came along.